Welcome to The BackStory, a peek into JOIN’s Jewish Organizer Network. The BackStory introduces members of the passionate and creative network of people who are using JOIN’s community organizing tools to make social change and work for justice. Let’s get to know Allegra Stout, a 2013 alumna of JOIN’s Jewish Organizing Fellowship and organizer at the Boston Center for Independent Living. What’s your background in community organizing and social justice? I grew up attending National Organization for Women marches and meetings with my mom, and I was raised to be a feminist and a critical thinker. I also grew up volunteering with kids with disabilities, spurred by my relationship with my younger sister, who has Down syndrome. In high school, I started to put these two parts of how I related to the world — 1) my inclination towards identity-based social justice work and 2) my passion for working with people with disabilities—together when a friend introduced me to the disability rights movement. I started reading and asking questions, and I started a disability rights student group in my first semester at Wesleyan University, where I also gradually claimed my own identity as a disabled person. I led the group throughout my four years at Wesleyan, slowly building a vibrant disability community and working on campaigns such as a creating a Disability Studies course cluster and educating professors about the needs of students with disabilities. I didn’t realize it at the time, but along the way I was applying organizing principles such as building relationships through one-to-ones and intentionally developing leaders over time, and collaborating with other groups when our interests aligned. You are an alum of the Jewish Organizing Fellowship. How did you become involved with JOIN for Justice, and the Jewish Organizing Fellowship specifically? Even before I applied for the Jewish Organizing Fellowship, JOIN led to some of my first exposure to the concept of organizing as something people actually get paid to do, and as a field with a tried-and-true body of skills and tactics. At Wesleyan, we talked a lot more about “activism.” I heard about JOIN from alumni, and the process of researching JOIN and community organizing helped me understand that I was already organizing, but also that JOIN could teach me to do it a whole lot better and provide a supportive, challenging community. Working with awesome, energetic, thoughtful leaders! 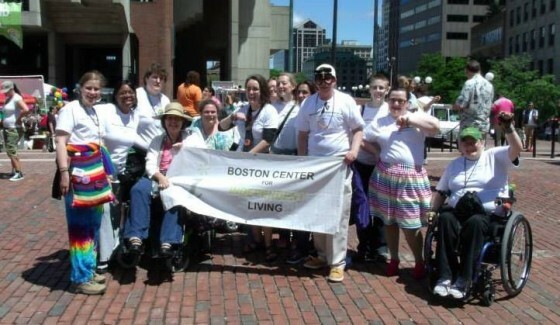 Read: I’m a community organizer at the Boston Center for Independent Living (BCIL), a disability services and advocacy non-profit with the mission of doing whatever it takes to help people with all disabilities, of all ages, live as independently as possible. Much of my work has focused on building consumer protections into One Care, a new managed care program for people with disabilities that was made possible by the Affordable Care Act. We’re also currently embroiled in a campaign for transit equity for people with disabilities who rely on the RIDE, the MBTA paratransit service for those who can’t use the T and buses. Last year, RIDE fares doubled to $4 each way, or even $5 for some trips, leaving many folks imprisoned in their homes. What does all that actually look like? Well, like most organizers, I spend a lot of time talking and a lot of time in meetings. This week, for instance, I worked with a BCIL leader to co-facilitate a membership meeting about the RIDE, showed my support at a State House hearing about a mental health treatment bill, participated in a coalition meeting with other groups working to roll back the RIDE fares, and checked in with several members by phone about our next steps. And I read and sent a lot of emails. Occasionally, my work gets more dramatic! 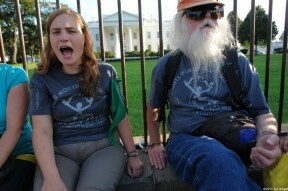 I’ve twice organized groups of BCIL members to participate in actions in DC with the national disability rights direct action group ADAPT. 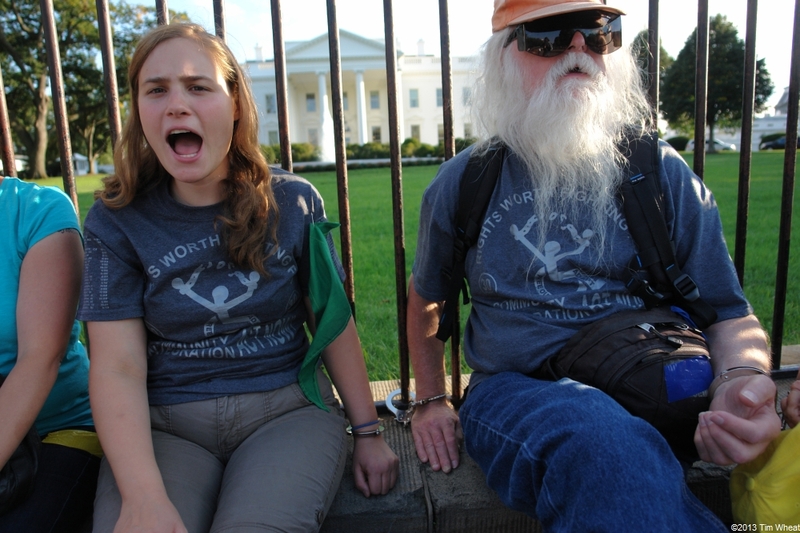 This September, we protested at the House of Representatives just before the government shutdown, and thenmoved on the White House, where I was arrested along with sixty other people from across the country. The experience of marching through the streets and taking action with hundreds of other people with disabilities and allies helps energize us throughout the rest of the year. What’s a story that shows the impact of the organizing work you are doing? Last month, I planned a victory party for a recent win, a new $1.1 million in state funding for Independent Living Centers to help people move out of nursing homes and into their communities with the right supports. At the party, BCIL members and friends came together to celebrate our countless hours of planning lobby days and calling and visiting legislators. One leader, Anne, spoke about her experiences of being locked up and abused in nursing homes, finally moving into her own apartment with the help of BCIL direct services staff, and then beginning to organize to help others gain their freedom. Anne spoke of her transformation from feeling like she was solely dependent on others to realizing that she could contribute by sharing her story and her passion. Later, a member who is still battling to get out of a nursing home reflected that hearing Anne’s story not only gave her strength to continue working for her own freedom, but also inspired her to join us in collective action. Through sharing our stories and building relationships, we are forming the powerful community we need to achieve freedom and justice. How does your Judaism inform who you are as an organizer or leader? Right now, my Judaism is shaping who I am as an organizer by introducing me to nourishing communities and powerful, inspiring peers and mentors. My Judaism led me to JOIN and helps me connect with others who are teaching me a great deal, and also leads me to spiritual communities where I find space for the reflection and rejuvenation I need to continue my work.